The Ideal Appliances for Your Outdoor Kitchen - Executive Landscaping, Inc.
Picture this: an outdoor kitchen worthy of the greatest chef or the most fired-up grill master, equipped with everything one could imagine all under the open sky. Really, that open sky is the limit, as having the proper design will give you an outdoor kitchen that not only meets your needs, but also satisfies your every wish. At Executive Landscaping, Inc., we work with clients across the Gulf Coast to create outdoor kitchens that are masterpieces, customized to meet their needs as well as their budgets. There are, of course, certain things that one should look for in outdoor appliances. From the basic type of appliance to the features each appliance has, you need to consider how you’re planning to use your outdoor kitchen, what kind of space you have and your budget. Some people require very little to have the perfect al fresco cooking space, while others need a full suite of appliances that could rival those found in the kitchen of a luxury home. As you plan, think about how best to achieve the goal of not having to go back into the house when you’re entertaining outdoors. What appliances will help you accomplish that? Are you simply heating up food, or do you want to chill and store the ingredients you use and have them within arm’s reach at all times? Do you want to have a chilled supply of beverages on-hand or ice readily available? All of these questions will help you design an outdoor kitchen that will meet your objectives, and there are appliances and accessories that are perfectly suited to your needs. First and foremost is the grill. 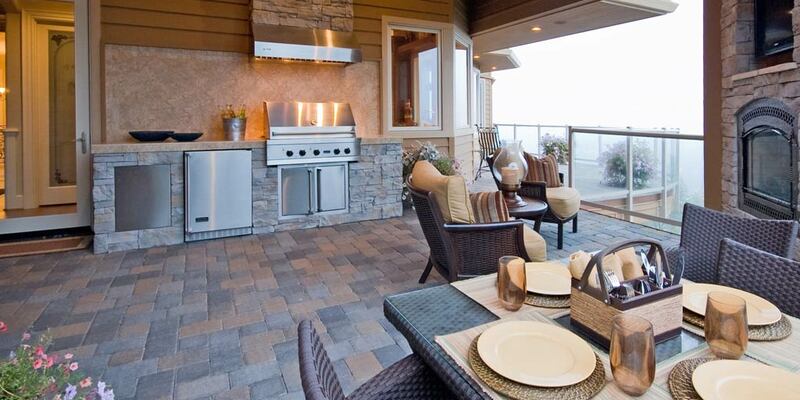 Built-in grills, specifically, create a great focal point and help bring cohesion to the look of an outdoor kitchen. The grill is the cornerstone of it all, the very centerpiece of the entire space. As the primary heat source, it should be chosen with care so that you have the size, type and features that suit your needs. Consider the type of heat you’d like to use. Options include gas, charcoal, infrared and pellet grills. From there, you’ll also need to decide on the size. The most popular size for built-in grills ranges between 30 and 32 inches, though they are available in sizes ranging from 24 inches all the way up to 62 inches. The intended use of the grill largely dictates the ideal size. So, too, does the overall dimensions of the outdoor kitchen’s completed design factor into which size will best accommodate your needs. Side burners are gas cooking surfaces that function much the way that stovetop burners do. They’re ideal for the preparation of foods that don’t require the grill-top and come in single burner options as well as double burner configurations or even in combination with griddles. Icemakers don’t take up a great deal of space but are invaluable for keeping your drinks properly cooled as you serve them. Refrigerators and fridge/freezer combinations are a popular appliance option for a fully realized outdoor kitchen. They’re especially beneficial for keeping prepared foods cold or frozen in addition to maintaining the freshness of raw ingredients. Similar to the function they serve in indoor kitchens, vent hoods are critical for keeping smoke and heat at bay during cooking over an outdoor grill. Vent hoods between 4 and 8 inches larger than the surface of the grill achieve the greatest amount of effect. Having a sink nearby is essential when you’re prepping foods like meats or poultry for the grill. You’ll maintain a tidy workspace as well as keep things sanitary – which means a happier experience for everyone. To keep things weatherproof, select a stainless steel sink with a faucet that has been specifically designed for outdoor use. If you’re a pizza lover and enjoy the taste of a fire-baked crust, add a pizza oven to your outdoor kitchen design. They can become a focal point on their own or easily integrated into the space for a more cohesive look, so think about what your overall vision is. At Executive Landscaping, Inc., we have years of experience in planning and installing dream-worthy outdoor kitchens for clients across the Gulf Coast, and we can give yours a design that will really get you cooking. Give the team of outdoor experts at Executive Landscaping, Inc. a call to learn more about how we can achieve the outdoor kitchen of your dreams!